Utilizing only 1% of the earth's deserts to produce clean solar electric energy would provide more electricity than is currently being produced on the entire planet by fossil fuels. Solar thermal electric power plant generates heat by using lenses and reflectors to concentrate the sun's energy. Because the heat can be stored, these plants are unique because they can generate power when it is needed, day or night, rain or shine. 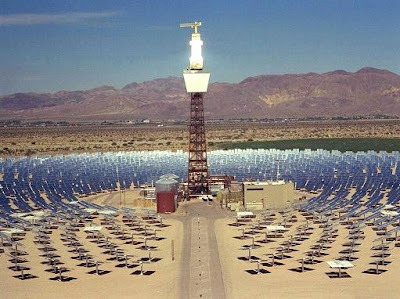 Solar thermal electric systems operating in the US today [Solar Parabolic Troughs] meet the needs of over 350,000 people (equal to the population of the city of Fresno, CA or Miami, FL) and displace the equivalent of 2.3 million barrels of oil annually. Solar thermal power plants create two and one-half times as many skilled, high paying jobs as do conventional power plants that use fossil fuels. A CEC (California Energy Commission) study shows that even with existing tax credits, a solar thermal electric plant pays about 1.7 times more in federal, state, and local taxes than an equivalent natural gas combined cycle plant. If the plants paid the same level of taxes, their cost of electricity would be roughly the same. Over 700 megawatts of solar thermal electric systems should be deployed by the year 2003 in the U.S. and internationally. The market for these systems should exceed 5,000 megawatts by 2010, enough to serve the residential needs of 7 million people (larger than the state of Georgia) which will save the energy equivalent of 46 million barrels of oil per year. The sun's heat can be collected in a variety of different ways: Solar Parabolic Troughs consist of curved mirrors which form troughs that focus the sun's energy on a pipe. A fluid, typically oil, is circulated through the pipes which is used to drive a conventional generator to create electricity. Solar Parabolic Dish systems consist of a parabolic-shaped concentrator (similar in shape to a satellite dish) that reflects solar radiation onto a receiver mounted at the focal point at the center. The collected heat is utilized directly by a heat engine mounted on the receiver which generates electricity. Solar Central Receivers or "Power Towers" consist of a tower surrounded by a large array of heliostats. Heliostats are mirrors that track the sun and reflect its rays onto the receiver, which absorbs the heat energy that is then utilized in driving a turbine electric generator. Grid-connected electric plants; process heat for industrial use. Stand-alone small power systems; grid support Grid-connected electric plants; process heat for industrial use. Dispatchable base load electricity; high conversion efficiencies; energy storage; hybrid (solar/fossil) operation. Dispatchable electricity, high conversion efficiencies; modularity; hybrid (solar/fossil) operation. Dispatchable peaking electricity; commercially available with 4,500 Gwh operating experience; hybrid (solar/fossil) operation.